Touchscreens and digital graphics are everywhere, but for people who are visually impaired, they can be a major hurdle to using modern technology. But this is set to change, thanks to tactile technology that automatically converts complex digital graphics into braille and stick-on smartphone buttons that make apps navigable by touch. There are 30 million blind or partially sighted people in Europe and only one in four of these individuals are working. Even those in employment still have to rely on support or assistive technology to carry out their daily tasks. Hars and his team have developed a device called Tactonom, an A4-sized touch pad that turns digital graphics into a tactile display and enables blind people to access complex digital information like tables, graphics, maps, diagrams and apps. 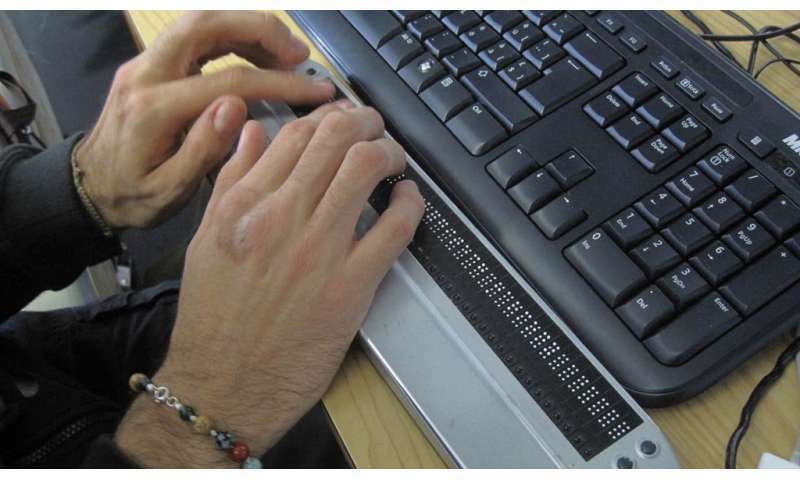 In about three to five seconds, Tactonom uses complex software to translate digital information into braille text, which is a touch-based language that uses a series of raised dots to represent words or images. The pad has 10,591 tactile points and uses a camera to track the blind person's fingers so it can arrange graphical information around in them in a coherent manner. There is also a voice assistant to read aloud particularly complex parts which cannot be displayed by braille because of size limits of the pad. They are now working on incorporating artificial intelligence to make the translation process even faster. According to the UK's Royal National Institute of Blind People, many people lose their jobs as their eyesight deteriorates, but if they had the right support they could continue working. 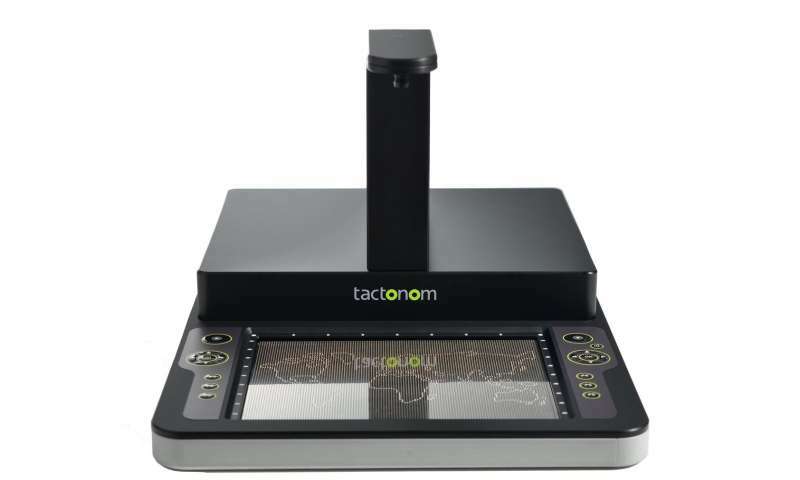 Before launching the Tactonom device in Germany in 2019, Hars and his team are ironing out a few last technical issues. He says the device needs to be flawless to prevent any risk of miscommunication because any errors could lead a blind person astray much longer than those without visual impairments. This is particularly costly in a professional environment. Even as progress is made in getting more visually impaired people working, situations like navigating to an office, sending messages on a phone or going for a meeting still poses other challenges. According to Boaz Zilberman, CEO of Israeli technology company Project Ray, new touch-based technologies for smart phones could address some of these issues and improve the quality of day-to-day life for the visually impaired too. 'Being visually impaired requires a lot of cognitive capabilities and memory (to operate a smart phone),' said Zilberman, adding that this is not a problem for some, but for others, particularly elderly people, it is. Using helpful apps, like maps, calling or messaging, can be particularly challenging because they have different display layouts and require remembering different combinations of swipes or patterns. Current solutions focus on using old flip-phones with a few buttons and some downloadable applications, but these are either limited in the services they provide or are contained in a system that is still too complicated for blind people. Project Ray has instead developed a simple two-button system that sticks on a smartphone and combines with an application to make any device suitable for a blind person. Together, the adhesive buttons and app create a simplified interface on a smartphone that is automatically imposed across all system functions and ensures applications follow the same layout. The result is that a blind person can use different applications much easier, which improves their quality of life in everyday situations. For example, quickly finding out which street they are on or when the next bus is coming. 'And of course they can better communicate, like email and social media,' said Zilberman. This technology is already available in Israel thanks to Project Ray's partnership with a mainstream service provider, which Zilberman says allowed them to reach 25% of all blind people in Israel in just one year. Project Ray has now conducted a market analysis of Europe to establish a similar business model. They are already in discussions with one of the biggest mobile service providers and hope to start selling their touch-based technology in Europe by mid-2019.